What was I doing travelling to Chichester then on to Arundel on a very hot day when I would have been better off sat in the shade of the trees in my garden? It was already hot by nine o’clock in morning. Whilst changing trains at Guildford Station, a cappuccino from FCB kiosk. It was not great. Train to Portsmouth from Guildford packed. A fast service London Waterloo to Portsmouth only five coaches. Drunks on the train. At Havant, slow train to Brighton pulls in, time to run across the bridge and catch the train. Why not time it better? Train packed, standing room only. Train full of drunks. Many more drunks when I alight at Chichester. The reason why, racing at Goodwood, Glorious Goodwood. At Chichester Station a train of Pullman coaches. I expect a steam locomotive. Sadly not, diesel engine front and back. Train is so long, diesel locomotive on the crossing, road closed. I decide to take a walk along the Chichester Ship Canal. I think not far to Chichester Harbour. I am wrong, a long way. Amazing sculptures along the route. I call in Coffee Lab. Very annoying, Clifton Coffee beans shipped from Coffee Lab in Winchester on Wednesday not in. Makes it even worse. Old beans. Their Colonna beans also old. They say they have more recent, will bag for me.I say ok, will pick up as I pass by later. Cold brew? No, but will do me a Japanese iced filter later. To the market. Only one stall I am interested in. The stall with the excellent onions and tomatoes. At first I mistake the wrong stall, but eventually find. Environmental standards on this market a disgrace. On one stall, fresh produce wrapped in plastic, sweating in the heat. The man with the tomatoes and onions, tells me that on the Arundel farmers market they will not even be able to use plastic carrier bags. I say use paper. He says costs. I say tough. There is a cost to the environment on using plastic, Society should not carry external costs, but at least the stall is using brown paper bags on which to drop produce, as do most market stalls. Coffee stall with beans in the midday sun, temperatures in excess of 30C a disgrace. If want coffee beans, Edge coffee van in Draper’s Yard of Coffee Lab, but not of this stall. Lunch at St Martins Coffee House. It is packed, but I manage to find a table in the shade in the garden. Owner not around. A pity as I had fond sources of organic coffee. Head down Pallant, North and South. Quiet streets running parallel to South Street. Lovely buildings. Cut down a narrow street, which brings me out at Coffee Lab. They have bagged the beans, make me a Japanese iced coffee. Train is running several minutes late. I miss connecting train to Arundel, have to wait for next train. At the bottom of the hill, a square with on one side a lovely little food shop. I buy cheese and a Florentine and a yoghurt coated flapjack. Lady serving tells me top entrance used to be the entrance or at least the exit. She said its closure has killed the town. People enter the castle at the bottom entrance and most not aware of the existence of the town. Interesting exhibition in Arundel Cathedral. Ghost like apparitions in the pews. At first I thought only those near the door. But no, throughout the Cathedral. I guessed it was the departed souls of those who died in World War One. I was suprsied how many, Arundel only a small town. My guess was correct, to mark 100 days of the end of WWI. I think 95. Home a little after ten, very tired. Is this sad little market someones idea of a joke? Maybe middle of winter, early January, but this is mid-April, spring. I chatted to one of the stalls, to learn it does not get much better in the summer, when fresh produce. I found a leaflet, but what was shown appeared to be wishful thinking, as only fresh meat on the market today. I saw no bread, cheeses, cask ales. I learnt there was a market Saturday, but up by Lincoln Castle. That there was a market every Friday, but in a different location. Therefore had one found next week, a market further down the High Street, then turned up the next week, and found no market, would you turn up again? And what of publicity? I have seen none. I had had afternoon tea at Henry’s, was walking back down the High Street, through The Stonebow, was passing Stokes on High Bridge, when I noticed a few stalls further down the High Street. As I walked past the stalls, I noticed people were walking past, not even glancing at the stalls, let alone stopping to have a look. Very apparent no one was there for the market, but then with no publicity, only half a dozen stalls, hardly surprising. I would not make a special trip. Is this the best Lincoln can do, a city of 100,000 souls, surrounded by villages, a county town for an agricultural county? But then Lincoln, a market town, does not even have a market. Whoever is responsible for this market should hang their heads in shame. I did at least pick up excellent strawberries. Guildford farmers market is not at its best in the winter months, fewer stalls, and on a day like today, cold, miserable and damp, and yet the High Street was packed, far busier than I have seen it mid-week for a farmers market. At the bottom of the market a guitarist Rob Berry playing, hard to tell how good, as he was playing playing to backing music, which is always annoying, but from what I could hear, quite good. I picked up a leaflet, so badly designed, as to be almost illegible. I suggested he uploaded all of his albums to bandcamp, would reach a far wider audience, and people know where to find him, share with their friends. At the top of the High Street, a guy and a girl playing, Undercover, he on guitar, both on vocals. In a better setting and with better choice of music, potentially worth listening to. They have recorded a few demo tracks. They should have with them on CD or DVD. Either give away, or sell for 50p or a £1. You never know who may pick them up. But essential quality recording. Nothing worse than a bad recording. Upload to soundcloud, ideal for demos, work in progress. And please, no covers trying to copy the original. If I wanted the original, I would go to the original. Improvise, make it your own, show you have talent as musicians, any fool can copy. Before the market, I made a detour to St Mary’s Church. Three schoolchildren from the Royal Grammar School, two on violin, one on cello, they were surprisingly good. Sufficiently good, that if they played a concert in St Mary’s, record as live concert and upload to bandcamp. St Mary’s have installed new heaters, maybe just the one. Before the heat came out via convection. This one was fan assisted. I would have thought someone would have had the intelligence to turn off during the concert. Off Celtic Baker a wholemeal loaf. He gave it to me already wrapped, said he had saved it for me. Now that is what I call service, especially as I was not at the market last month. Off the bee stall, honey with walnuts. Though they seem to have overdone the walnuts. Usually, honey with added walnuts, today, a jar jammed full of walnuts with added honey. The lady who runs the stall with excellent pies, had run out of her Cornish pasties. I say Cornish pasties, actually not, far better. She gave me the one cut in half which she had on display, which I thought very kind of her. Excellent lunch in Thai restaurant in Jeffries Passage, cappuccino in Harris + Hoole, then although only mid-afternoon, I decided to call it a day, as a cold, damp, miserable day, and it was already getting colder. Guildford farmers market takes place once a month, first Tuesday in the month, in Guildford High Street, January being the exception. This month, there is to be an extra market in two weeks time, on Tuesday 17 December 2013. But what a pity not the week later, or maybe as that Christmas Eve, the weekend, Saturday 21 December 2013, then catch people just before Christmas. The lady who sells the excellent pies, told me she would have brought a lot of extra stock, including decorated pork pies, but 17 December was too early for Christmas. Thursday, market day in Aldershot, is one of the few days when Aldershot is busy. Though busy is a relative term. Busy as opposed to dead, which is the norm on other days of the week. Saturday is a day when most town centres are busy. Not Aldershot. Lion and Lamb Courtyard in Farnham has more people on a Saturday afternoon, than are seen on the street in Aldershot. Market day is the only day worth going into Aldershot, and only then for the excellent fruit and vegetable stall at the bottom of the market. A rare example of the local council making an intelligent decision, was when the market was relocated to the town centre from the ground floor of a multilevel car park just off the town centre. When the market was in the car park it was depressing, damp and cold, access was down a stairwell from the street that doubled as a public urinal. Relocating to the town centre, meant the market was out in the street, visible, not hidden away. When Westgate opened last year, it hit the market hard. Yes, it has recovered, but not to the level it was before Westgate opened. Before, I used to find a queue at the fruit and vegetable stall, now I never find a queue, and often the market is deserted. Shopkeepers apparently are complaining, one said it brought people out onto the street in front of their shop! Now it is difficult to comprehend why a shopkeeper should complain that there are people on the street. Would she rather there was no one on the street? And if they do not go into her shop, that says more about her shop. Another, who is quoted as complaining of the competition, I have spoken to, and he says he has no problem with the market. It is also claimed, Guildford only has a farmers market. Simply not true. 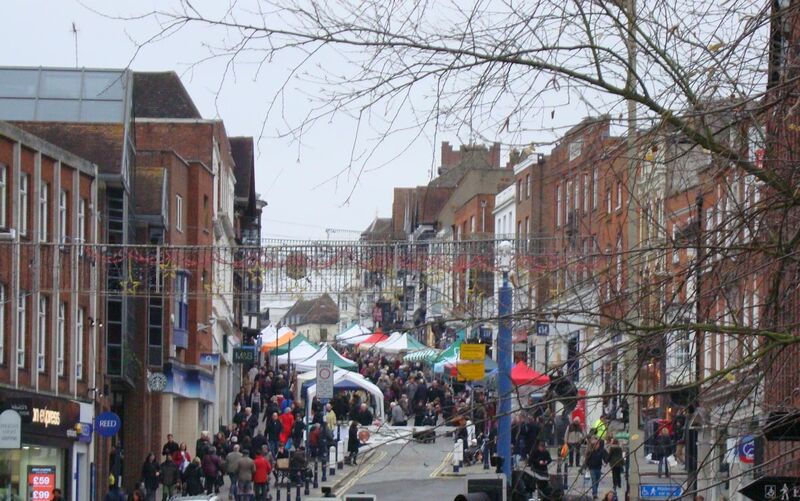 Guildford has a popular farmers market once a month in the High Street on the first Tuesday of the month. It also has a very popular market in North Street on a Friday and Saturday. Very shoddy reporting by the Aldershot News. It would appear they have spoken to a few whinging retailers, who are not representative. A few more corrections to the what was reported in the Aldershot News. The stallholders do not bring their vans in at 2pm and knock down their stalls. What stallholder is going to knock down their stall when there is business on the street? They bring their vans in at 4pm. Only rarely do they do so earlier, and that is when there is very bad weather and no one is on the street. What of the problem of cars and vans, late afternoon every day? A pedestrian street should be just that, pedestrian. Yes, there is obstruction. The obstruction is not the market. The obstruction is Costa with their tables and chairs outside, reducing the highway to a narrow gap where people are forced to walk in single file to get past, and to wait, if pedestrians are coming the other way. The council is well aware of this obstruction, and chooses to turn a blind eye. It is difficult to comprehend a handful of retailers who are complaining of a market that is bringing people into Aldershot. Not only into Aldershot, but into the town centre. It goes without saying, there has been no consultation with the stallholders (the first they knew there was perceived problem is when they saw it on the front page of the local rag). It goes without saying, no consultation with those who use the market (the first I knew was when the stallholders told me). This would appear to be yet another example of the Rotten Borough of Rushmoor (as it is known locally) wishing to destroy small businesses. What is destroying Aldershot is not its Thursday market, it is Westgate (or WasteGate as local retailers call it) and a dysfunctional local council that appears to be hell-bent on destroying not only Aldershot town centre but also Farnborough town centre. The sick joke is that £1 million is being spent tarting up Farnborough town centre, £1 million poured down the drain. And the justification for this waste of public money? In order that markets may be held in the town centre! Aldershot applied for Portas Pilot status. They failed, but it would have been money down the drain. Mary Portas stresses time and time again, diversity, local community, markets.